O’Donnellan & Joyce is offering a tremendous number of family homes throughout Galway city and the surrounding area in its forthcoming auction on July 24. The auction on July 24 is commencing at 10am and will take place in The Harbour Hotel, Galway. According to Anne Harding of O’Donnellan & Joyce this all day auction has some exceptional family homes on offer, especially around Galway city and the surrounding areas. The following are some of the family homes which are on offer. No 4 Presentation Road, Galway: A distinctive four bedroom city centre property, magnificently refurbished to a very high standard and oozing with style and class. This property has a modern interior while maintaining its old world charm. Open viewing Thursdays and Saturdays 2pm to 3pm. AMV is €300,000. No 86 An Creagan, Barna, Galway: A four bedroom end of terrace residence located in a well maintained estate. No 86 has a southeast facing garden and would be an deal family home or gilt edged investment property. Open viewing Wednesdays and Saturdays 11am to 12 noon. AMV is €260,000. 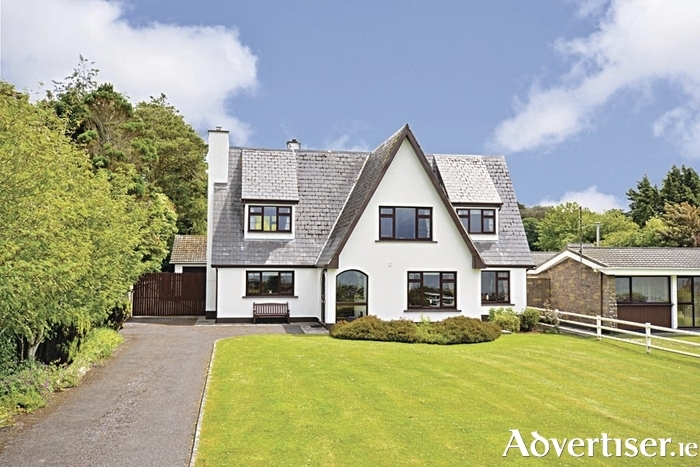 No 3 Gort Na Bro, Western Distributor Road, Galway: A three bedroom semidetached residence located to the front of Millar’s Lane on the Western Distributor Road. This home has a northeast facing rear garden with large shed. Open viewing Wednesdays and Saturdays 2pm to 3pm. AMV is €190,000. No 83 Devon Park, Salthill: A superb five bedroom semidetached residence located within a stone’s throw of Salthill. Situated in the most sought after residential addresses of Devon Park, this property has space in abundance and a large garden with self contained apartment. Open viewing Thursdays and Saturdays 11am to 12 noon. AMV is €475,000. No 17 Whitestrand Park, Salthill: A beautiful five bed semidetached property in turnkey condition, with off street parking to the front and a patio area to the rear. No 17 is conveniently located within close proximity of the city centre, Salthill Promenade, The Claddagh, and Spanish Parade. Open viewing Thursdays and Saturdays 12.30pm to 1.30pm. AMV is €350,000. No 293 Tirellan Heights, Headford Road, Galway: A four bedroom semidetached residence located on the Headford Road within walking distance of Terryland Shopping Centre, schools, and church. This house is in need of some modernisation. There is off street parking to the front and a good sized garden to the rear. Open viewing Thursdays and Saturdays 12.30pm to 1.30pm. AMV is €170,000. No 20 Inchagoill Road, Newcastle, Galway (executor sale ): A five bedroom detached residence within close proximity of NUIG and UHG. No 20 has oil fired central heating and a large east facing rear garden. Open viewing Wednesdays and Saturdays 5pm to 6pm. AMV is €295,000. No 1 Holly Grove, Renmore: A beautifully located three bed semidetached property in first class condition, situated on large corner site. This modern family home is not overlooked and boasts exceptional views over Galway Bay. Open viewing Thursdays and Saturdays 5pm to 6pm. AMV is €235,000. No 4 Clifton Avenue, Newcastle: A superb four bedroom semidetached residence with space in abundance located only a stone's throw from UHG, recreational grounds, the NUIG main campus, and all major facilities. This property is in pristine decorative order and repair and would provide a quality family home. Open viewing Wednesdays and Saturdays 11am to 12 noon. AMV is €235,000. No 59 River Grove, Oranmore: A delightful three bedroom semidetached residence located in a popular residential development. No 59 extends to circa 1,000sq ft and is presented in excellent condition. This would be an ideal starter home or gilt edged residential investment. Open viewing Thursdays and Saturdays 11am to 12 noon. AMV is €120,000. Ballyglass, Turloughmore: A superb four bed bungalow located in the village of Turloughmore, just a 10 minute drive from Claregalway and five minutes from Lackagh. This home stands on a site of circa 0.75 acre. It would be an ideal family home, having been recently refurbished and modernised. Open viewing Wednesdays and Saturdays 3.30pm to 4.30pm. AMV is €195,000. Lake Road, Loughrea (executor sale ): A magnificent imposing residence with breathtaking views overlooking Lough Rea, this house is surrounded by manicured gardens with magnificent views from all rooms. It is within a leisurely stroll of the centre of Loughrea town and offers easy access to Galway city. Open viewing Thurdays and Saturdays 5pm to 6pm. AMV is €250,000. For further details and open viewing times see www.odonnjoyce.com for a full brochure and pictures of each property, or contact the O’Donnellan & Joyce auction team on 091 564212.